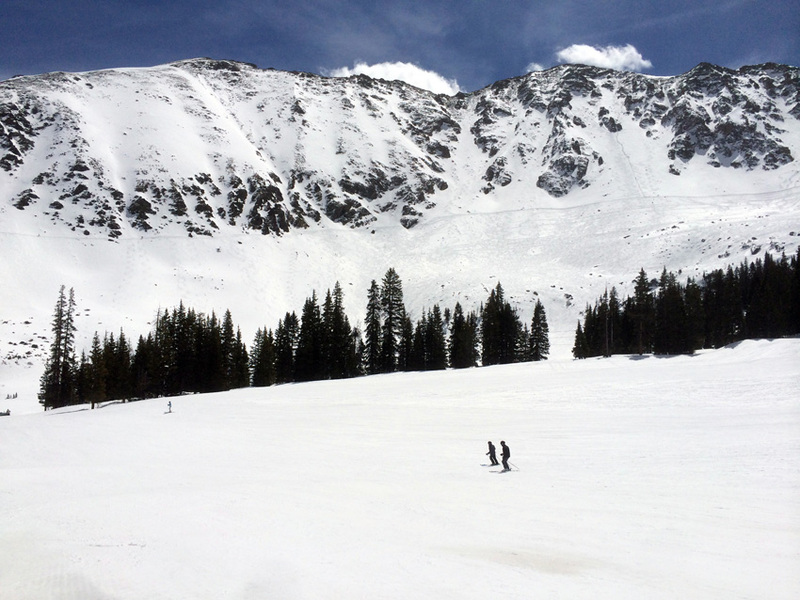 A Day in Arapahoe Basin. 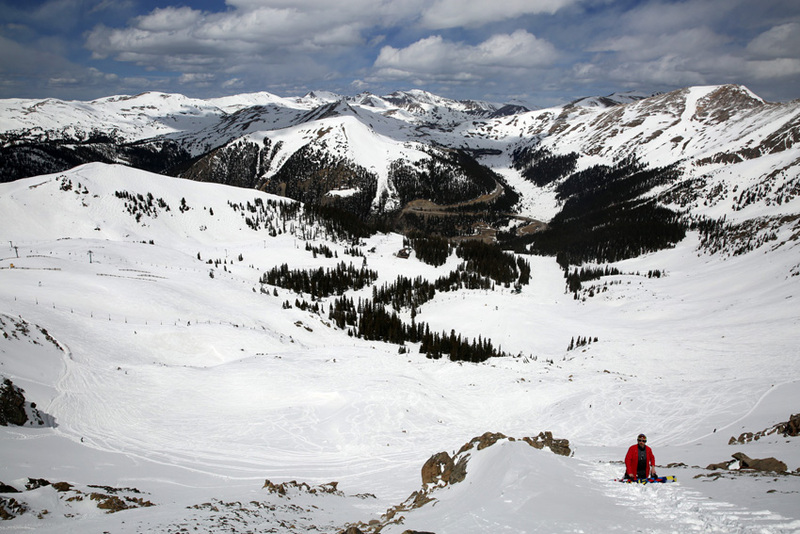 We left Breck for the day and headed to A-Basin!! 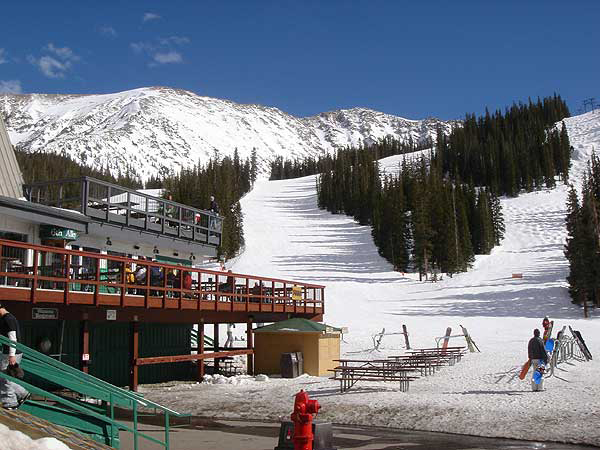 Our passes to Breckenridge also allowed us access to many other mountains including Keystone, Vail, Heavenly, and Arapahoe Basin. 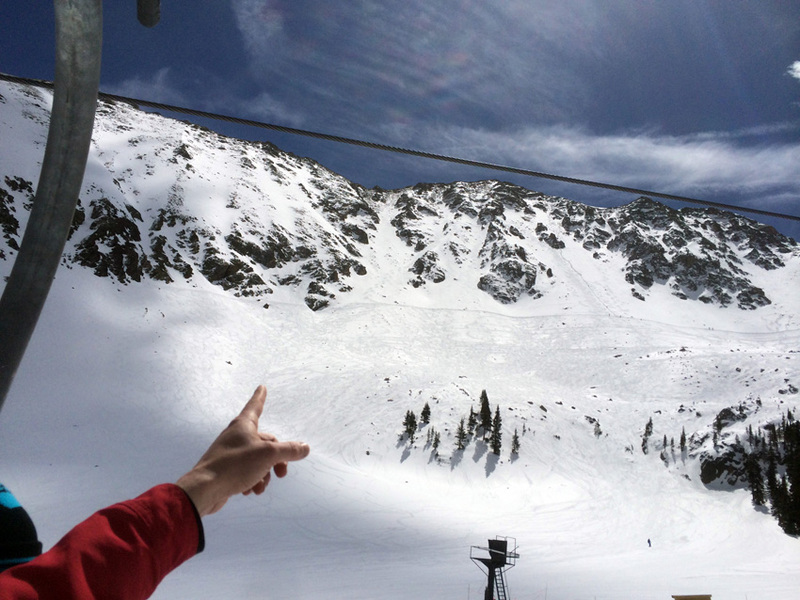 A bunch of us wanted to explore another resort so we decided to hit A-Basin which was only a beautiful scenic 30 minute shuttle from downtown Breckenridge. When we arrived there was no lift lines and it was a beautiful bright sunny day. Nothing like having the mountain all to ourselves. 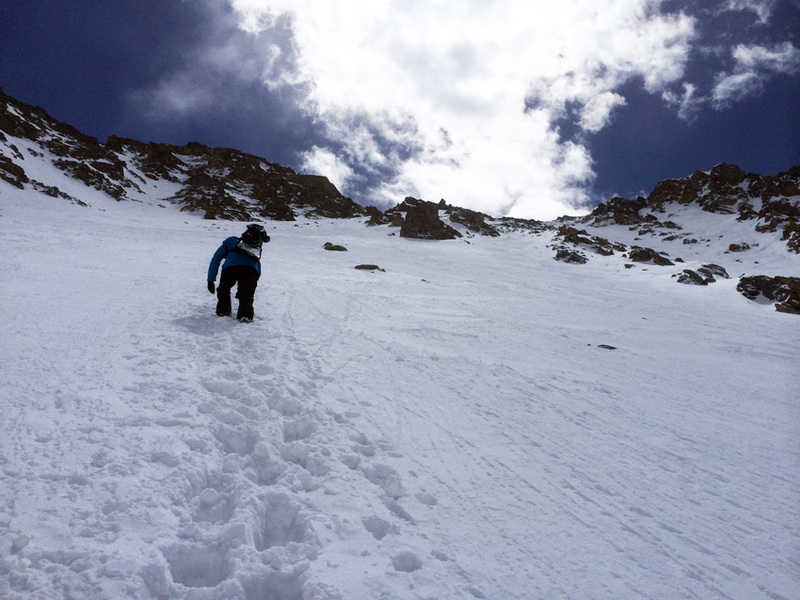 As we were all going up the lift we saw that a couple people were hiking up the east wall. OvR crew member Vinny was inspired and said if the ridge hike was open it would be really cool to get up there and check it out. The crew all seemed up for it and we planned our route. Unfortunately when we reached the top, the peak hike was not open so we decided to traverse over and check how the hike was looking from the bottom. Dan saw his line from the lift. 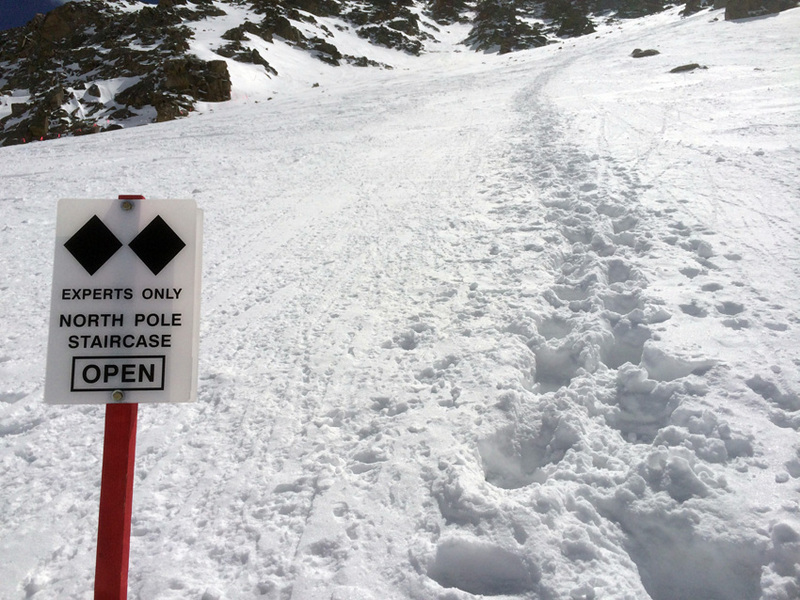 A bunch of us got over to the North Pole staircase and realized that it was pretty steep and considering we were already about 13,000 feet above sea level some people decided to take laps on the fresh couple inches that had fell in bounds the last couple days. 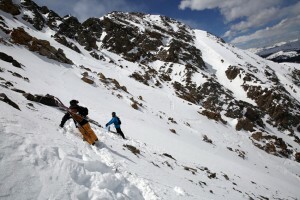 OvR crew members Dan, Vinny and Chris felt ambitious and decided to get up there and try to get a glory run in. The hike was steep and the sun was bright but they kept charging. As they got to the top they could see the entire A-Basin and it was a beautiful site. Dan mid hike in the center of A-Basin. There was some sketchy moments on the variable terrain and it wasn’t the best idea to try and traverse over the loose rocks and ice but when we got settled in and ready to drop the untouched run was well worth it. As the sun disappeared behind the clouds we realized that we had to drop in before we had no visibility. Vinny was the first to get strapped in. 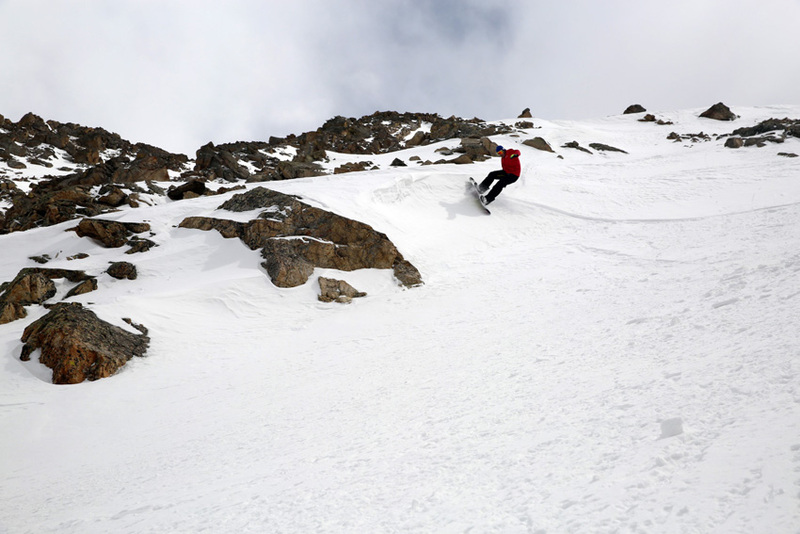 As he dropped in he quickly vanished down the steep shoot in a powdery bliss of snow. It was nice to see him sink a foot or so into his first two turns as he disappeared. Vinny goes first and gets after the freshness!!! Chris dropped second and made some solid turns on the way down. 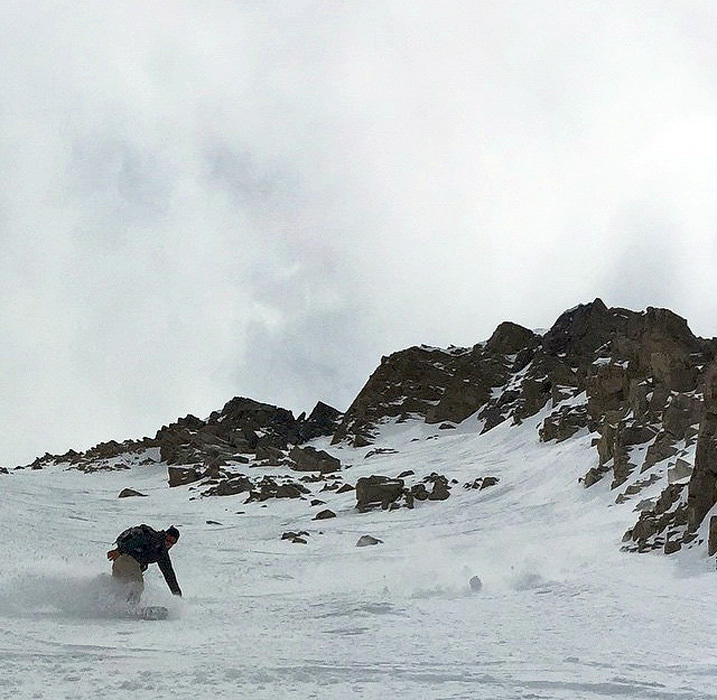 He entered the “White Room” on a couple slashes and managed to see Vinny posted up mid trail so he could stop mid run and shoot dan as he dropped. Chris getting some of the action in between taking flicks. Dan was the last to drop and as we looked up at him he hit all the right spots. He criss crossed the trail and hit every bank and gap in site. It was rad to see him blast everywhere that we didn’t. As he came down we were both pointing to the left and right where we missed potential features. He was quick on the draw and got them all. Team work makes the dream work, especially on this type of terrain. Dan mid slash on his glory run. The hike, traverse and drop in took most of our day. 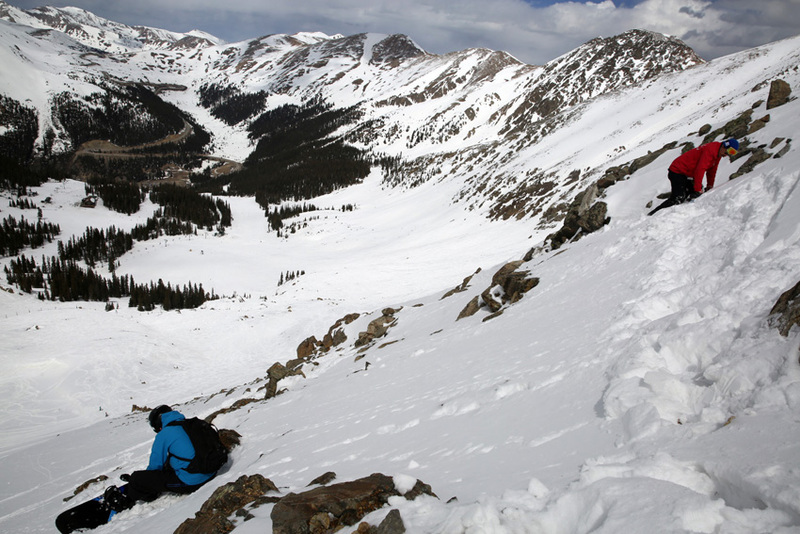 By the time we met back with the rest of the crew there was an hour left to shred and thats exactly what we did. 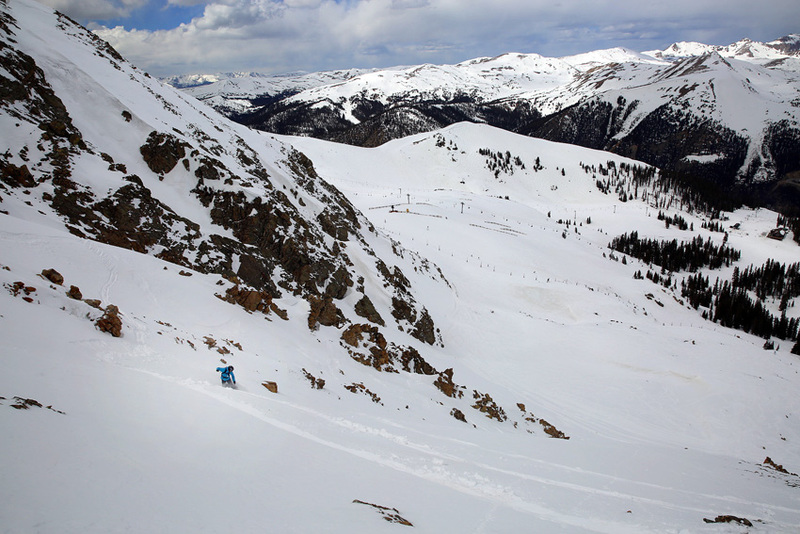 As we took laps around different parts of the mountain everyone was in great spirits and we all agreed that we made the right decision to come check out A-Basin. 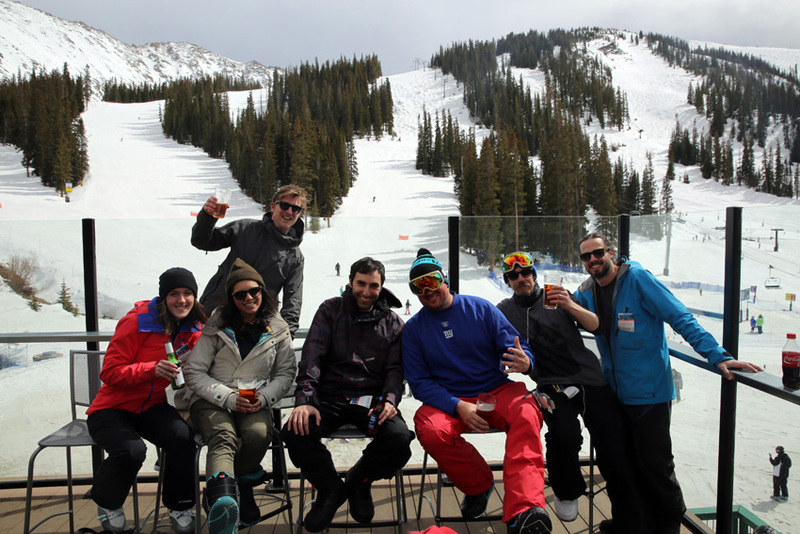 OvR Crew deep at the base of A-Basin!! Cheers!! 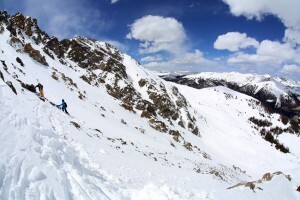 This entry was posted in Chris's Blog, News, OvR Shout Outs, OvRcrew, Trips and tagged A basin, Arapahoe Basin, Backcountry, CO, Colorado. Bookmark the permalink.